One of our favorite family vacation destinations is Disneyland in Southern California. We start thinking about our next trip as soon as we get home! Our last Disneyland trip started as a quick getaway with the kids. My parents, who are in their late 60’s, decided they wanted in on the fun. Then my 92-year-young Gram decided that she needed to visit Disneyland one more time. No longer a small family trip, our group covered an 87-year span! I cannot tell you how excited my two daughters were to have Great-Gram join us. The three of them immediately started planning all the fun! My Gram and mom lived in Southern California nearly 50 years ago and have seen Disneyland grow from a time when you used lettered tickets for attractions to the technological wonder it is today. We will cherish the memories and photos from this trip forever. We learned a lot of tricks for visiting Disneyland with grandparents on our trip. Here are our tips for traveling with the young at heart to Disneyland Resort. Maneuvering wheelchairs and motorized scooters is a lot easier when crowds are lighter. It’s getting tricky to find a time of year when Disneyland isn’t crowded, but some weeks are better than others. We consulted several different “crowd estimator” websites like www.isitpacked.com before we picked a date for our trip. We picked the first week of May. Crowds were lighter than at other times, but it was still crowded. Consider including at least one weekend night, especially if you visit in an off-peak week. Park hours are generally shorter, with less entertainment scheduled, on off-peak days. You should get at least one chance at nighttime parades and fireworks if you include a weekend. Gram was able to maneuver fairly well during the daytime. However, the parks became more crowded at night for the parades and fireworks, and it was difficult for her to move around. Try to avoid Main Street, U.S.A. during these times. Consider having older family members watch from the top of Main Street, U.S.A. – near the park exit. Views of the fireworks are not as good, but it was much easier for us to move around and exit the park when the show was finished. We found that it was easier for our grandparents to spread our visit over several days. Four to five days is what works for us. Your ticket cost per day goes down with every extra day you spend in Disneyland and when we booked with Get Away Today, we got a free night at our hotel, so the extra time didn’t cost a lot. On the first day of our trip, we arrived at mid-day. We entered the Disneyland after dinner to watch the Paint the Night parade and fireworks. The price of the extra day was so little that we didn’t feel like we wasted money by going to the park for only a few hours. We took the kids on a few rides while their grandparents found seats on Main Street U.S.A. for the parades and fireworks. We usually buy Park Hopper tickets, but with grandparents, I recommend One-Park-Per-Day passes. We moved a lot slower than we normally would, and found that we generally stayed in one park for the whole day. 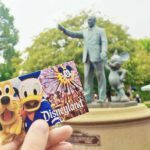 One-Park-Per-Day passes allow you to visit either Disneyland or California Adventure on any day of your trip, but you can’t “hop” to the other park on the same day. Bonus: You’ll save about $50 per person. Rent a wheelchair or motorized scooter (ECV) for older family members. Gram is pretty spry for her 92 years, but we knew that she would not be able to do all the walking that comes with a trip to Disneyland. Disneyland offers daily wheelchair, ECV, and stroller rentals. However, we still had to get her from the hotel to the resort entrance each day. We suggest renting an ECV outside the park for your entire trip. We found several places nearby that rent ECVs and strollers for multiple days. We selected One Stop Mobility, Inc. They happened to be located right on our hotel property, so that was extra-convenient. The staff was friendly, they had several units available for rental, and the cost for our whole trip from pick-up to drop-off was less than what we would have paid for daily rental at Disneyland. They even deliver to local hotels. Gram drove her ECV all over Disneyland, to and from our hotel, and everywhere else. When traveling with seniors, we recommend selecting a hotel either on Disney property or just across the street from the resort. ART (Anaheim Resort Transit) offers transportation to all the hotels surrounding the Disneyland Resort, and many hotels offer shuttle service, but we didn’t want the extra hassle of boarding with an ECV. Selecting a hotel directly across the street allowed us to come and go with ease. We have stayed in the Fairfield Inn, Tropicana Hotel and Suites, Carousel Inn, and Anaheim Camelot Inn and Suites on our various trips. All are located on Harbor Blvd. and within an easy walk of the resort. These hotels fill quickly, so book as early as you can. Get Away Today works with most of these hotels, and has a low price guarantee on Disneyland hotel and ticket packages. Click the button to check rates and availability for your trip. One thing we did not do that we would highly recommend is to plan a rest day in the middle of your trip. Not being one to miss any fun, Gram pushed herself every day. She had a wonderful time, but was thoroughly exhausted by the end of our trip. We all could have benefited from a day by the pool or doing some souvenir shopping in Downtown Disney. Consider scheduling a Character Dining experience, like brunch or an early dinner at Goofy’s Kitchen at the Disneyland Hotel. You’ll still get your dose of Disney for the day, but you’ll have more energy for the next day! We let our two girls and my grandma each plan one of our days. On Gram’s day we spent the day in California Adventure and had the Earthquake Ice Cream Sundae from the Ghiradelli Ice Cream Parlor for dinner before watching World of Color. If you’re thinking of visiting Disneyland with grandparents, we say go for it! Our four-generation trip to Disneyland is one we will always remember. Want the best price on a Disneyland hotel and tickets? If you’re thinking about booking a Disneyland vacation, check out our Disneyland packages at getawaytoday.com or call any of our reservation agents at 855-GET-AWAY. Save $10 on any Southern California vacation package at Get Away Today when you use our exclusive coupon code: Tips10Trips. Read more about our partnership with Get Away Today here. 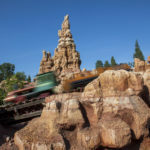 The BEST rides at Disneyland – and how to get on them FAST! Lisa is an elementary school teacher and former travel agent, living in Utah. She loves traveling with her husband and two daughters as often as possible. They love traveling everywhere, but Disneyland is their favorite family destination.